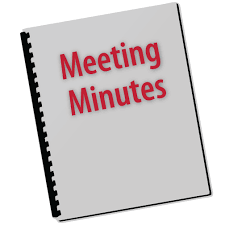 Minutes are the permanent official written record of the decisions made by a body of people who met on a certain date for a specific purpose. It is an important document that is relied upon to see the exact wording of any decision that was taken. Without official minutes, memory would provide the only guide to enforcement of a decision. It is fair to say that each person’s memory and interpretation of an event can be different, coloured by a variety of things such as political view, personal perspective, and position of power. Once the wording of a decision is confirmed, the organization can proceed with its interpretation and implementation or perhaps its reconsideration. A reading of the minutes will verify whether all decisions were made with proper authority and due process. This is very important, as even a seemingly insignificant decision can affect the dignity or quality of life of someone who is subject to the enforcement of that decision.